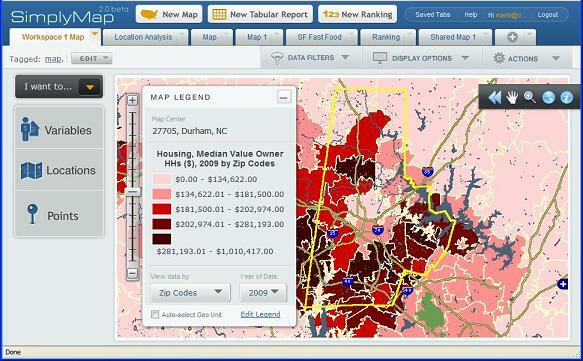 Online mapping and data access has become even easier with the launch of SimplyMap 2.0. A long time favorite of Economics and Public Policy courses (and faculty) at Duke, this program provides a straight forward interface for web-based mapping and data extraction application that lets users create thematic maps and reports using US census, business, and marketing data. Version 2.0 includes improvements designed to make it easier to find and analyze data and create professional looking GIS-style thematic maps. Give SimplyMap 2.0 a try and let us know what you think. Support is always available in Perkins Data and GIS.